This boat was a 1973 wooden Post - after adding new bow pulpit, PVC rub rails, replacing several planks, replacing several ribs, new mahogany transom, painting with awlgrip, interior redo from carpet to headliner. It was an incredible eight weeks from start to finish and into the Annapolis Powerboat Show. This boat was a 1957 Owens. Batten seam hull sides with double plank bottom. She had sunk in the bad ice storm of “77” (people drove cars on the Severn River that year) and was about to be bulldozed into landscape of my fathers boat yard. She could have been named “Frankenstein” because she was made from parts of every boat on bull-dozer row in the back lot. At the time, I did not have children, but with three brothers, I knew I wanted to have girls. Hence; “Daddy’s Little Girl”. I had this boat for seventeen years and it went through many evolutions over that period. 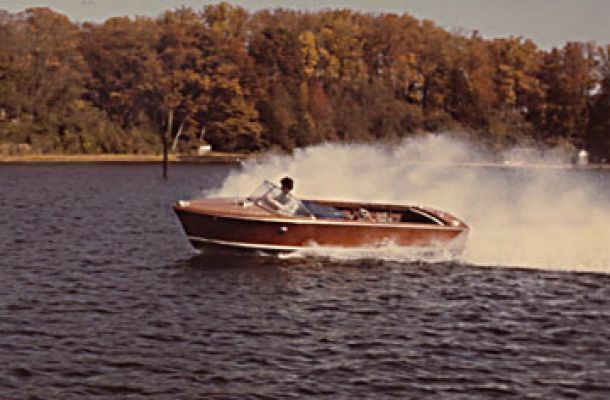 This boat was a 1959 18’ Chris Craft Continental. I was 13 when I purchased her for $500.00.